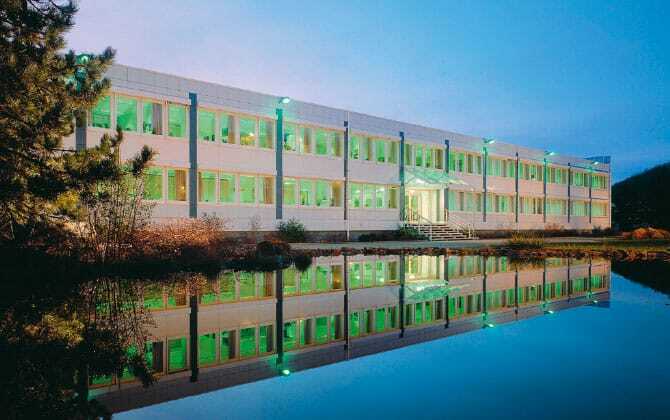 Established in Germany in 1974, over the intervening period URSAPHARM has developed into the globally operating group of companies it is today. In addition to its German headquarters in Saarbrücken (in Saarland), the international URSAPHARM network now includes sales offices in the Netherlands, Austria, Belgium, Poland, the Czech Republic, Slovakia, Russia and India. Thanks to partnership agreements with distribution partners, URSAPHARM products are also available in a number of other countries around the world. Everything begins with a simple idea. In the 1970s, eye diseases among the Saarland population were still largely treated with products from the nearby pharmacies in neighbouring France. This gap in the market was recognised by the four Saarland pharmacists Albrecht Holzer, Dieter Trox, Werner Buxmann and Werner Bernhard, the founders of URSAPHARM Arzneimittel GmbH. In addition to producing medicines, their focus was above all on professional, structured marketing of their products, primarily to pharmacies in Saarland. The results speak for themselves: within a mere ten years URSAPHARM was producing a complete range of eye care pharmaceuticals. Another ten years after that, in 1993, URSAPHARM achieved a great success: the market launch of the internally developed and swiftly patented COMOD® system. With its intelligently structured container and a special dosing pump, this new product represented a revolution in the pharmaceutical industry; until then it was considered impossible to make liquid preparations such as eye drops sterile and stable over a longer period without the addition of preservatives. The patented COMOD® system (COntinuous MOnoDose), however, reliably prevents the solution inside the application system from coming into contact with the surrounding air. The result: no pathogens can come into contact with the solution, and sterile application is guaranteed even after the bottle has been opened. The COMOD® system is generally just as suitable for use with sprays as with drops. Following this ground-breaking development, the company continued to expand through the manufacture and sales of its own products. Along with eye care medicines, URSAPHARM was also manufacturing general practice products, becoming involved in enzyme therapy and developing pharmaceuticals for the treatment of allergies and venous diseases. Furthermore, contract manufacturing was developed as an additional area of business. In ultra-modern manufacturing plants that comply with both national and international requirements, pharmaceutical products are manufactured for third parties by specialists in accordance with strictly validated manufacturing and testing methods. A further significant milestone in the history of the company was achieved by URSAPHARM in 2008. Firstly, the therapeutic necessity of treatment with high-quality hyaluronic acid solution was confirmed. Furthermore, the Federal Joint Committee stated that in this regard there is no alternative to the HYLO® GEL produced by URSAPHARM. HYLO® GEL is therefore the first medical product for eye lubrication for dry eyes to be classed as prescribable in German history. The result: from that point onwards, statutory health insurance companies were obliged for the first time to cover the cost of treatment with HYLO® GEL in certain medical cases (such as damage to the tear gland, various autoimmune diseases, incomplete closure of the eyelids (lagophthalmos) and paralysis of the facial nerves (facial paralysis).